Between the late Middle Ages and the early modern period (roughly, 1470–1600), long-venerated saints of the Roman Catholic Church grew younger and more vital in artists’ eyes. According to Elizabeth Rhodes, a professor of Hispanic studies at Boston College who researches Spanish hagiography, the progression between the two paintings above—both of St. Joseph—is typical of a shift she has observed not only in Spanish but also in French and Italian treatments. On the left is a late Middle Ages image from an illustrated codex. The work of Milanese artist Cristoforo de Predis, it shows St. Joseph as a bent, white-bearded elder, visited in dreams by an angel to tell him that the child Mary carried was of the Holy Spirit. A century or so later, in 1599, the Spanish Renaissance painter El Greco represented Joseph, at right, as a vigorous, almost preternaturally tall young man, the protector of the Christ child in the prime of life who towers over the landscape. Male and female saints alike underwent this process of reverse aging. In the mid-15th century, when Donatello carved from wood his dramatic standing image of Mary Magdalene, she appeared aged and gaunt, the ascetic at prayer. In 1665, when Bartolomé Murillo painted her, it was as a young woman prayerfully on her knees, her garments falling away to reveal her voluptuousness. 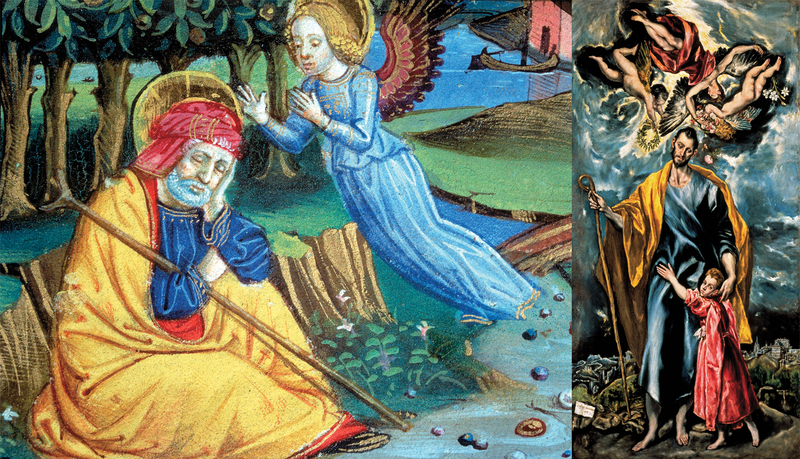 Rhodes focuses on imagery in popular Spanish chronicles of the saints—with titles such as Flos sanctorum (Flowering of the Holy) or Leyendas de los Santos (Legends of the Saints). The saints in early portrayals, she suggests, reflect the more influential role elders played in the relatively stable society of the late Middle Ages. With the Renaissance came a shift in focus toward physical beauty and youth, and the saints—by definition both of this world and “heroic”—underwent a youthful transformation. Rhodes cites other contributing factors, including the emergence of Protestantism in the 1500s. Reacting to new competition, Catholics at the time may have wished to “dress up” their saints, she says, and make them “as vigorous and appealing as possible.” (An early 17th-century Flos sanctorum observes of Joseph: “When he was engaged to the Virgin, he was Vir, a mature, robust man. . . . He wasn’t as old nor as decrepit as some say and as painters paint him.”) What’s more, in Spain, Rhodes says, an empire was on the rise, under Ferdinand and Isabella and then under Charles V, fueling a desire for “young, vibrant images”—and for saints reflective of the vigor of the realm. Thomas Christopher is a Connecticut writer.